The stabbing of a leading Brazilian presidential candidate jolted an already wildly unpredictable campaign to lead Latin America's largest nation, with doctors saying Friday that Jair Bolsonaro will be hospitalized for at least a week. Bolsonaro, 63, suffered intestinal damage and serious internal bleeding, said Dr. Luiz Henrique Borsato, one of the surgeons who operated on the candidate. He was in serious but stable condition and would remain in intensive care for seven to 10 days, Borsato said. The candidate was transferred Friday to a premier hospital in Sao Paulo, Brazil's largest city. 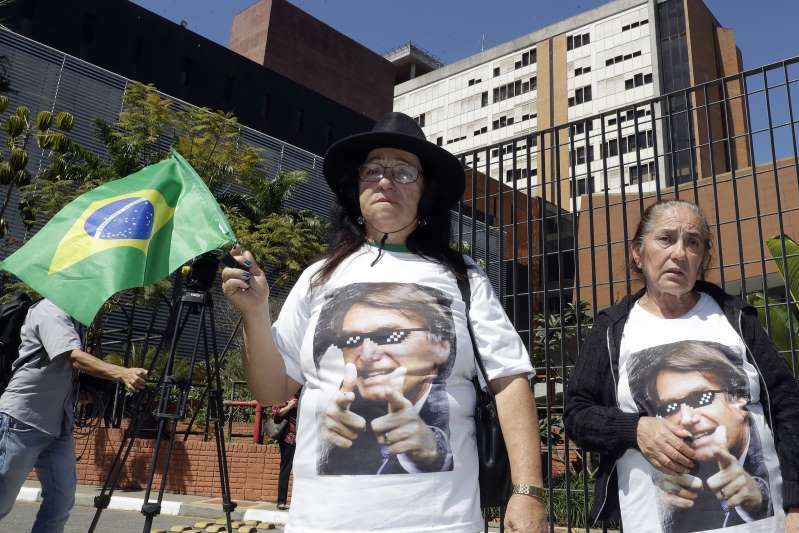 Supporters outside the hospital carried a giant inflatable doll of Bolsonaro dressed in a formal suit with a sash that said "President." "No matter what you think about him, he did not deserve this," said Mauro Rodrigues, owner of a construction business who went to the hospital to support Bolsonaro. "It will definitely increase his chances of winning the election because people will be more sympathetic toward him." The sentiment was echoed by Flavio Bolsonaro, who tweeted: "Jair Bolsonaro is stronger than ever and ready to be elected President of Brazil in the 1st ROUND!" The internet news portal G1 posted cellphone video, apparently obtained from police, of de Oliveira being questioned. Sitting on the floor with his hands cuffed behind him, a voice can be heard asking him who had sent him to attack Bolsonaro. "I didn't say anybody sent me," said de Oliveira. "He who sent me was God on high." Eraldo Fabio Rodrigues de Oliveira, who is married to a niece of the suspect, told the newspaper Folha de S.Paulo that he appeared to be "disturbed" and would often lock himself in a shed when he visited his family. Lt. Col. Marco Rodrigues of the Minas Gerais state police told reporters that de Oliveira, who was once affiliated with a leftist party, said he acted because he disagreed with Bolsonaro. G1 quoted a lawyer for de Oliveira, Pedro Augusto Lima Possa, as saying his client did not mean to kill the politician, only wound him. Federal police said another suspect was detained in connection with the attack and questioned. That suspect was released overnight but remains under investigation. Minister of Public Security Raul Jungmann said the number of federal police providing security to candidates would be increased because of the attack, adding that Bolsonaro had been warned against launching himself into crowds as he did Thursday, according to the government-run news agency Agencia Brasil. Currently, 80 federal police protect five presidential candidates who requested security, and 21 were assigned to Bolsonaro, according to Jungmann. Flavio Bolsonaro rejected the idea that his father incited the attack, saying the candidate was engaged in a campaign of ideas. He said the mainstream media bear some responsibility, accusing them of portraying his father as a "monster." Associated Press writer Sarah DiLorenzo reported this story in Sao Paulo and AP writer Peter Prengaman reported from Rio de Janeiro. AP writers Stan Lehman and Victor Caivano in Sao Paulo and Marcelo Silva de Sousa and Yesica Fisch in Rio de Janeiro contributed to this report.